Summon: +1/+1 for each other Skeever you've summoned this game. Skeevaton is a rare Neutral creature card. 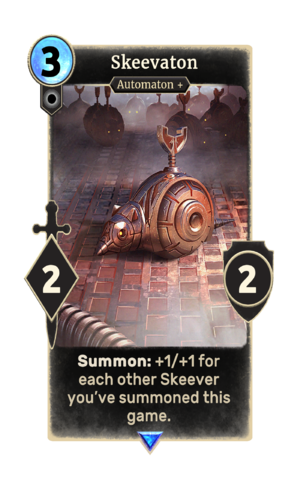 It is part of the Clockwork City story set. A playset of the card is awarded for completing The Caminus Pit. The premium version can only be obtained by soul-summoning, which is only possible after the completion of The Caminus Pit. This card's summon ability applies the Filthy Skeever card effect. The card's subtype was originally Skeever, until Automaton was added in September 2018.